I’m going to be upfront and say that Mamma Mia! Here We Go Again is a gift to mankind. It’s fun, it’s colourful, it’s endlessly loveable and appreciated by audiences and critics. Part of the reason why it’s so universally loveable is because it’s masterfully crafted: it took the original Mamma Mia! and polished it, giving it a brand new pastel look (courtesy of D.O.P. Robert Yeoman, who knows a thing or two about pastel palettes after having worked on every single Wes Anderson live action film so far), a new director (Ol Parker), and a script co-written by the patron saint of rom-coms, Richard Curtis. However, the sequel feels somehow milder than the original, directed by Phyllida Lloyd. 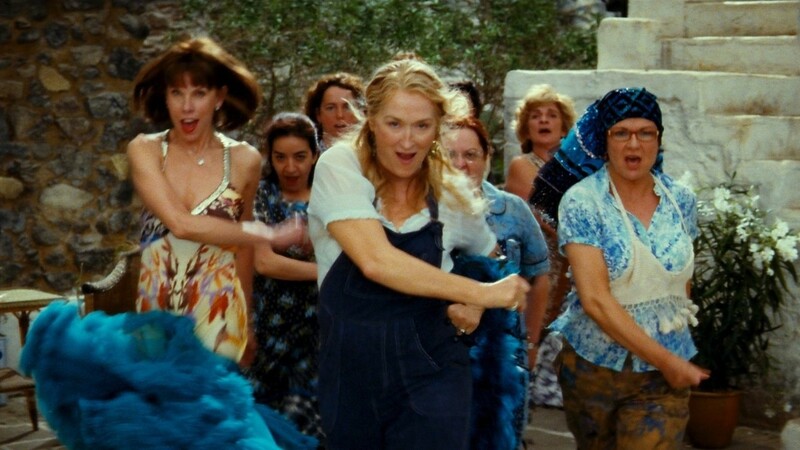 ‘How can something featuring Cher singing ABBA in front of a background of CGI fireworks feel milder than anything else?’, you may wonder: let me take you on a journey through the feminist explosion of raw camp energy that is the first Mamma Mia! and allow me to demonstrate. I don’t use terms like ‘feminist’ lightly, but Phyllida Lloyd’s Mamma Mia! is, first and foremost, not only a film for women but a film made almost completely by women, which is a rare instance in itself, but becomes a downright subversive move when we look at the landscape of mainstream blockbusters to which Mamma Mia! belongs. Produced by mastermind Judy Craymer, written by Catherine Johnson and edited by Lesley Walker, the main creative team behind Mamma Mia! is comprised almost entirely by women, and it shows. I am not going to argue that Mamma Mia!’s style is inherently feminine, because I don’t believe there is such a thing as a feminine style. Nevertheless, the world created by the stage musical and enhanced by the film adaptation is a utopia constructed specifically to the tastes and desires of women, and the film’s distinctive style is essential in the construction of it. In the opening sequence, after a soulful scene in which Sophie mails the invitations to her three possible fathers while singing ‘I Have a Dream’, against a backdrop of glittery blue sea, we immediately cut to a fast-paced montage of the three men being cool in various parts of the world to the beat of ‘Gimme! Gimme! Gimme!’, which ends in the glorious title card of the film, introduced by a plane causing an explosion of glitter. This is a declaration of intent in itself: leave the world behind, ladies, where we’re going we don’t need realism. We are going to a place of ABBA, gorgeous scenery, and charming men, and we’re going there on a glittery plane. Phyllida Lloyd’s direction is fully committed to this escapist premise and, instead of striving for realism and attempting to conceal the camera’s presence, decides to have fun with it and use its full potential. In fact, while Lloyd was first and foremost the stage director of Mamma Mia!, her cinematic adaptation is not merely a reproduction of the stage musical: it’s a dynamic expansion of its world which uses the new medium to create an even more dynamic and immersive experience. Lloyd seems to want to use every possible gimmick in existence. The camera barely stands still for more than a shot; instead, we get dramatic zooms! Spinning! Crane Shots! Hand-held shots! Upside-down shots! Slow-motion! The most obvious instance is the ‘Voulez-Vous’ sequence, in which all of these are combined in rapid succession: it’s over-the-top, it’s excessive, but it’s so much fun. In other words, it’s camp. Despite camp often sneaking its way into popular films and TV shows, it was born and remains a somehow subversive taste. As such, it is one of Mamma Mia!’s greatest merit to lean so heavily into it and to still be a huge mainstream success. Everything in the film is over-the-top to the point of being cartoonish: the acting, the script, the excessive and often unjustified cause-and-effect reactions, the musical numbers, the vocal performances. And yet, every element that would feel out of place in any other film has a right to exist in Mamma Mia! precisely because of its own absurdity, and ultimately it’s what makes the film great. Though my opinion is that the world of Mamma Mia! is very carefully built, whether this is intentional or not doesn’t really matter, seeing how enjoyable the result is. In fact, I’ve met both people who appreciate it, somewhat ironically, for its perceived ‘naïve’ camp, and people who genuinely love and empathise with it. The latter category (and this is not based on a generalization but on my own observations of the cinema audiences for Mamma Mia! Here We Go Again) is mostly comprised on middle-aged, white, heterosexual women, arguably the film’s main target. Even on a superficial level, it’s easy to see why: it’s female-led, romantic, escapist, and it stars Pierce Brosnan and Colin Firth. There are plenty of lesser films, however, that match these criteria. What makes Mamma Mia! a phenomenon that causes group of women to flock to the cinema together, often for repeated viewings, much in the fashion of cult audiences, is the fact that, unlike the majority of “women films” (although I truly and deeply hate this term), this is a film made for them by women just like them. It understands their desires and doesn’t patronize them, therefore earning the right to be at times self-deprecating and ironic as it is heartfelt and honest in others. Two examples are the ‘Dancing Queen’ and the ‘Slipping Through My Fingers’ numbers. ‘Slipping Through My Fingers’ is a touching number on motherhood, as Donna/Meryl Streep helps her daughter Sophie/Amanda Seyfried get ready for her wedding. It’s emotionally charged not only because Donna is preparing to see her daughter leave, but also because she is about to get what Donna never had and has actively avoided, i.e. a wedding and the traditional, heteronormative stability that comes with it. The ‘Slipping Through My Fingers’ montage then deals not only with motherhood, but with expectations of femininity, in a soulful, genuine manner. It’s the emotional heart of the film, especially because it’s paired with Donna/Meryl’s rendition of the heart-breaking ‘The Winner Takes it All’ which immediately follows it. The same issues, on the other hand, are dealt with in a completely different manner in the ‘Dancing Queen’ sequence, which is as close to an all-female utopia that we get in recent mainstream cinema. If ‘Slipping Through My Fingers’ and ‘The Winner Takes it All’ acknowledge and validate these feelings of powerlessness and melancholy, ‘Dancing Queen’ provides an escape. Women across the island ditch their husbands, their jobs, and their role of housewives to dance and shine and validate each other for a glorious few minutes, lit by the Greek sun, in a patriarchy-smashing celebration of womanhood in which the only man allowed is Benny Andersson (somebody needs to play that piano riff). The icon of the scene is the Greek woman dropping the olive branches she is carrying while letting out a liberating ‘Oh yeah!’ before joining the others in song and dance. That is precisely the feeling Mamma Mia! wants to elicit in its audience: it’s a temporary relief, it has to be pure escapist fun, it has to be over-the-top, because it has to be the opposite of real life. And yet, because of its deep understanding of its audience, it tackles precisely the issues they’re seeking escape from. In the world of Mamma Mia!, these issues are going to be resolved through ABBA songs, glitter and flashy costumes, and although these are not enough to solve real-life problems, they are enough to forget them for a while. Marina was born and raised on a little island in the south of Italy, which she left for the considerably larger island of Britain in hopes of finding better cinemas and a degree in Film Studies from King’s College London (she got both). Her taste in films is easily influenced by the amount of pastel pink in their production design and the presence of her heroine Greta Gerwig. Some of her favourites are Before Sunrise, The Royal Tenenbaums and Frances Ha. You can find her raving about Paddington 2 on twitter at @sobmarina_ , posting too many sunsets on instagram at @humandisasters and logging Call Me by Your Name too many times on letterboxd at @sobmarina_ .